Increase your knowledge and understanding of the amazing works of William Shakespeare. This English course Shakespeare - His Life and Work looks at the life and work of William Shakespeare, surely the greatest playwright of them all. The course considers his life, plays, poetry and prose and examines the literary devices he employed in his works. The lessons are interspersed with quotes from some of Shakespeare's most famous plays and videos of actors reciting his lines and sonnets. Completing this free online course will lead to improved understanding of the Bard, and deepen your enjoyment of his timeless work. This course is especially useful for students studying Shakespeare. You will have a good knowledge of the life and work of William Shakespeare. 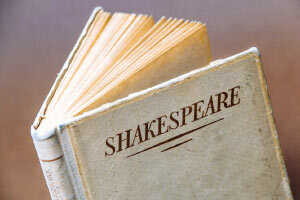 This course will help you to understand Shakespeare’s language, quotes and poetry. You will become more familiar with some of Shakespeare’s most famous plays. This course will introduce you to the techniques that Shakespeare used when directing on stage.